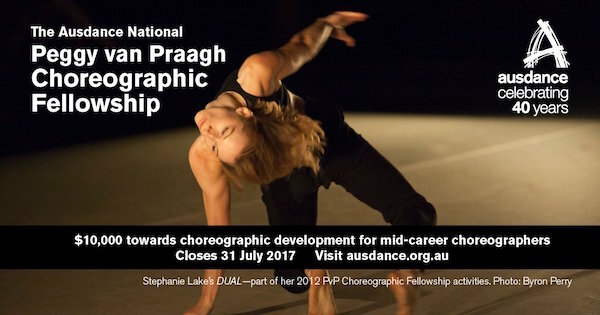 Applications for the Ausdance National Peggy van Praagh Choreographic Fellowship have opened and will close July 31st. Mid-career choreographers (35 years and over), who can demonstrate the value of the fellowship to their choreographic practice, are invited to submit an expression of interest. Dame Peggy van Praagh was the founding artistic director of The Australian Ballet (1962). She dedicated much of her career to fostering young Australian choreographers in ballet and contemporary dance. The next fellowship will be awarded at the 2017 Australian Dance Awards in Melbourne on Sunday 24 September. Eligible choreographers are invited to demonstrate the value of the fellowship to their own choreographic development, practice or career to submit an expression of interest. Fellowship activities should be completed within two years. The fellowship will not contribute to a performance, but you must produce a public outcome of some description. what your public outcome will be. provide a CV and two written references. Previous recipients are Lina Limosani (2015), Kay Armstrong (2013) and Stephanie Lake (2012). Visit ausdance.org.au for more information. For further information and to submit applications email: Communications & Publications Manager Rachael Jennings with ‘PvP Fellowship’ in the subject line.